Hospitality, comfort, and personal service guarantee an exquisite and romantic setting that ensures an unforgettable stay at Casa Azul Hotel Monumento Historico. This beautiful residence, located a few steps away from iconic avenue Paseo de Montejo, was built in the 19th century and declared a Historical Monument. Restored and refurbished, the original architecture of Casa Azul Hotel Momento Historico showcases the history of the Profirian Age in Yucatan of the 18th and 19th centuries. Featuring wide corridors that surround the inner courtyard, a Mayan stone fountain, a refreshing pool in the backyard, and a charming terrace, Casa Azul Hotel Monumento Historico is a whimsical retreat for guests seeking refined comfort. 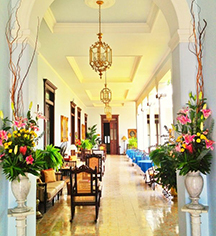 Casa Azul Hotel Monumento Historico, a member of Historic Hotels Worldwide since 2012, dates back to 19th century. Built in the 19th century, the hotel was declared a Historical Monument for its superb preservation and restoration of its original architecture. Age Requirements: Children 12 and younger are not allowed at this adults-only property. All guests older than 12 are welcome. 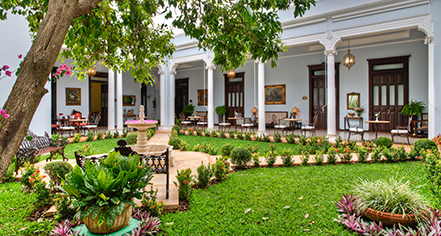 Adorned with precious antiques, exclusive objects d'art, luxurious fabrics, and wonderful flower arrangements throughout the property, Casa Azul Hotel Monumento Historico is an enchanting residence at the historic center of Merida, Yucatan. Learn more about the History of Casa Azul Hotel Monumento Historico .